Normally, we use words travel and tourism interchangeably. I think there should be a difference between these two. Tourism is just reaching the destinations but travel is more than that. When we left Batal, we headed towards Chandratal. 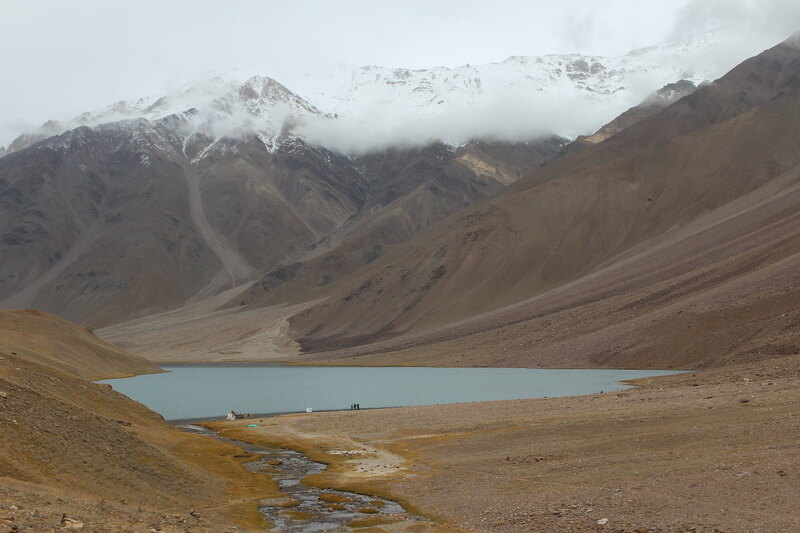 Chandratal is a small lake – like what you see at Deoria Tal or at Dhankar. The road from Batal to Chandratal is not very good in condition and I think by now in this series of travelogues, it has become a cliché to describe bad conditions of the road. The road was parallel to the Chenab river for a good stretch. Few kilometers before Chandratal we saw camps, where tourists might have spent the night, but the chill that we experienced the last night made us think that it was a wise decision not to go for the camping. It becomes too windy in the valleys there and if you have not come prepared for that, it is better not to be too adventurous. There are treks too for Chandratal from Kunzum Pass but before that one has to get acclimatized to the height. In the previous posts of this series, I have discussed why do we travel and what is more attractive – the destination or the travel itself. In this post, I want to discuss the difference between travel and tourism. Nowadays, we see a plenty of tourism websites and tour planners. They emphasize too much on the destination part. You can go to this place, then to that place, take a few days of rest and then reach to some viewpoint. What they miss is the experience part. We hardly get to know what we will experience at a certain place. At most, we are shown pictures of a place. There is a subset of tourism – pilgrimage. In pilgrimage, we get satisfied by seeing a temple and its deity. What we forget is that we should also ponder over why that city was chosen as the abode of the deity when thousands of other places were available. Why that place still sees thousands of devotees when there are hundreds of other big and small temple all around the country. I think when we ponder over all these questions, when we take a moment on our trip to be conscious of the surroundings and the effect that they have on us, we become travelers. The dictionary, the one I referred to, says that meaning of tour is 'a journey for pleasure.' For travel, it says 'a journey with some length.' Although not clearly visible, some distinction can be found between these two meanings. When we associate travel with pleasure, we have a picture in our minds of some viewpoints, a weather, and some monuments. Then we associate a certain type of experiences with these imaginations. We reach the destinations, get those experiences and come back. This is a tour. We have toured a place. In travel, you go beyond all these typical experiences. You go to a place without a predetermined set of expected experiences. You create your experiences as you travel. You take a moment to look at the sunrise and get mesmerized by what you see and when you realize something so beautiful – a phenomenon happening every day but we do not find it like that any other day. You see a stream of water and then wonder that this small stream of water dug a significant portion of that valley. You see a mountain that has been there for millions of years and you have been there only for few hours. When you plot this on a time scale, you look like a tiny dot as compared to the time that has evolved to enable you to undertake this journey. Of course, these are few things that travelers experience. The list is not exhaustive. Far from it. You can count multiple other experiences. The whole point of travel is to experience something which is unique for an individual. We parked our vehicle few kilometers before Chandratal. It was a small trek to the lake. Recently this lake was included in the lakes of Ramsar convention for the conservation and sustainable use of wetlands. The way to the lake was a narrow one and we could see a stack of rocks finely balanced. This might be a pastime for travelers as well as it might be a ritual. There was no one around whom we could ask those questions. The lake had colorful flags, something we had seen first at Rohtang La. Little we did know that it would become such a common occurrence throughout our travel in a Buddhist land. Surrounded by high hills from two sides and few meters high rocks on remaining two sides, Chandratal lake had crystal clear water. This place was so quiet. Towards the high hills, you can see snowy mountains and it would look like those snow patterns are the source of water for this lake. After Chandratal, we continued our journey further. The ascent to Kunzum Pass was steeper than that towards Rohtang Pass. When we reached Kunzum Pass, it was raining. Situated at 4500 meters, Kunzum Pass should provide a good panoramic view of the surroundings but nothing could be seen in the rain. While returning we could not see anything from Kunzum La as it was already dark, but we saw remnants of a day old snow. At Kunzum La, we observed a tradition or ritual performed by drivers. There is a small monastery at Kunzum La. One can cross the Kunzum Pass without going to that monastery but we saw that every driver took a detour and drove around the monastery before moving on. 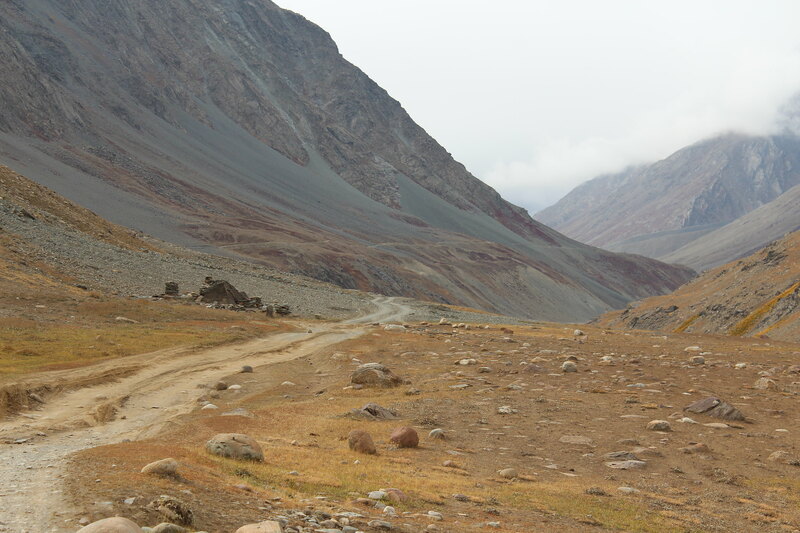 After Kunzum pass, we entered the Spiti Valley. 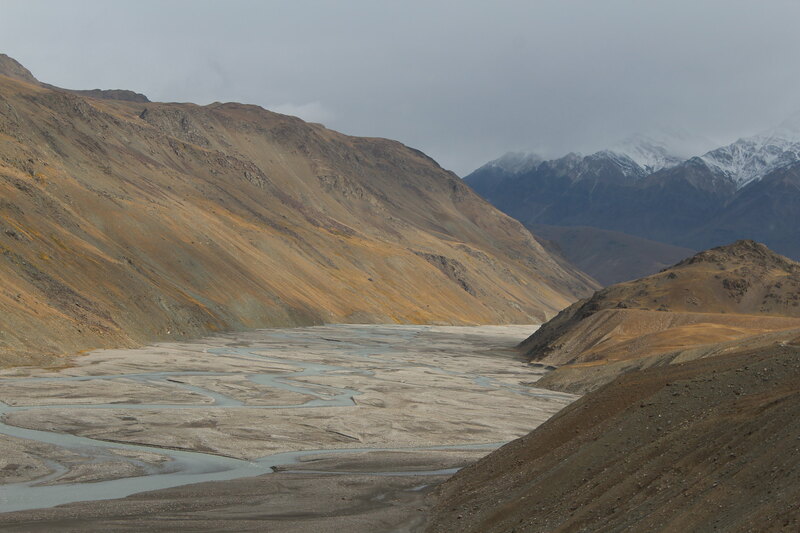 The Spiti River flew in the direction of our travel. Although opinions might vary on this one, but I will say that the stretch from Kunzum pass to Kaza is the best part of this trip. The valley is wide. You will see mountains on both sides of the road – barren and dark. The river occupies only a small portion of the valley but it seems that the whole valley was occupied by the river at some time of the year or in the past. The terrain of the valley says that. It consisted of small rocks and pebbles and was flat. A typical scene of any riverbed. As it was raining, we could not see too far and hardly anything was visible above those mountains. One might think that all this is a picture and we are invited to be a part of that. As soon as you try to be a part of that, the picture moves. You also move with it. And the journey continues. Final few kilometers before Kaza were somewhat different in terrain then what has been described above. The river flows deep in a small ravine like structure. The valley is almost flat from one end to another. Small villages are situated here and there. And we can find few stretches where there is a straight road for a significant length. There you stand. With mountains. With small grasses. With chilling winds. Nothing else could be seen. No signs of life. At that moment, it might strike you that you are so small compared to nature. The view of Kye monastery from the other side of the road is something to be remembered. Again comparing with the movie trilogy – The Lord of the Rings – one can relate with this. When armies of Mordor attack Gondor, a view of Gondor from a distance is shown. Needless to say, that Kye monastery does not look like Gondor, but the view from that distance surely reminds you of a city on a hill. It will seem like a miniature sculpture carefully constructed by a power equipped to do so. 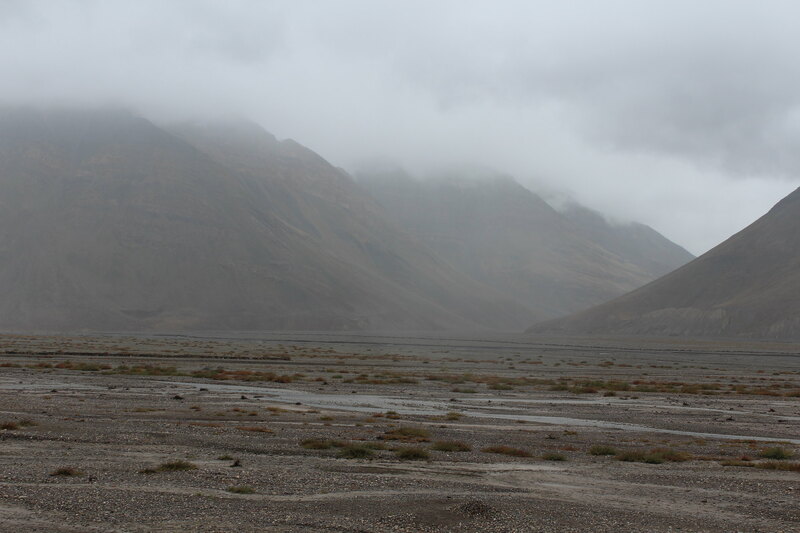 By evening, we arrived in Kaza – the heart of the Spiti valley.